When building my car this winter, it was obvious we were going to need some ballast in the right hand side in order to meet the minimum weight. Since the 1999-2005 Spec Miatas must weigh 2450lbs compared to the 2300lbs that a 1990-1993 car requires, the only question was “how much?” It turns out the answer was “a lot”: about 175lbs! There are several ways people add ballast. Lead is the ideal solution but nothing was available in this quantity locally and I would have had to smelt and pour my own weights which was unappealing. Many people use plate weights from a sporting goods store but stacking enough 45# plates was going to be unwieldy and I didn’t like the options for bolting them in place. Some people on SpecMiata.com have built systems that attach to the seat mount points which is safe and clean but technically not permitted by the rules. Finally, there are some ready-made solutions like this Rennen Metal option but the shipping was going to cost more than the weight! 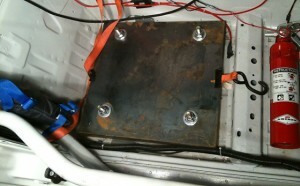 I was already concerned about the safety of having that much weight attached to the floor pan so working with guidance from my roll cage fabricator TC Design in Milpitas, CA, I designed extra large 1/4″ thick backup plates that run 4″x20″ along the frame rail using a total of 4 x 5/8″ Grade 8 bolts to keep everything in place. Each backup plate adds approximately 4.5# to the weight of the car. The inboard side runs next to the brake and fuel lines from just in front of the rear subframe brace towards the front of the car. Washers and nylock nuts complete the install. 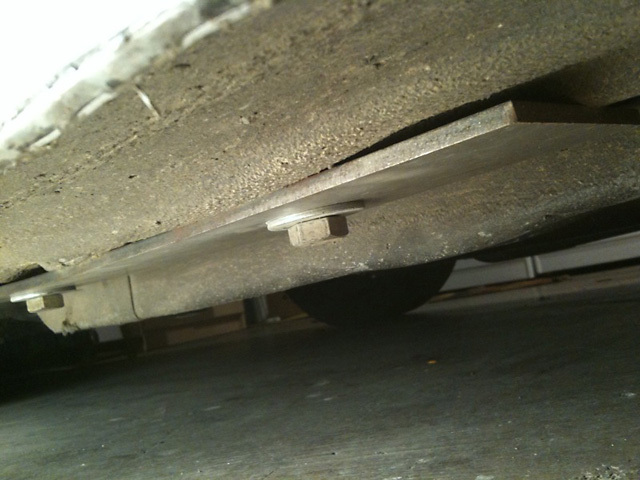 The goal was to provide as much surface area as possible to resist pulling through the floor pan in case of a serious crash. Installed in the photo above are 1 x 1″ base plate, 9 x 1/8″ plates and 2 backing plates for a total of 171.5#. With one gallon of gas, my car runs just a few pounds above the 2450# required minimum weight. I have since removed a couple of the 1/8″ plates in order to add a Cool Suit system so I maintain the same total and corner weights. If you can’t find someone local to cut the steel for you, I had an excellent experience with Bayshore Metals in San Francisco. Steve ([email protected]) did a great job not only with the sales process but also in waiting for me to pick up the ballast when I was running late en route to our first race weekend. Disclaimer: the above experience and downloadable template are a guide and come with no warranty of any kind. Consult with an expert and make your own judgment before using this information. You alone are responsible for your safety!